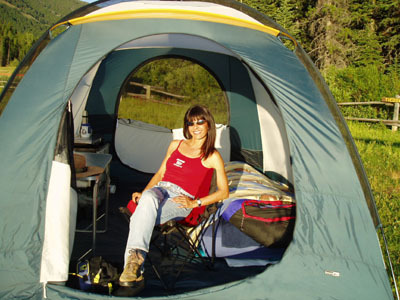 In this section, I'll share which camping and aviation products have worked best for me. 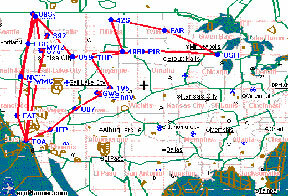 For frame of reference, shown left is an example of a normal trip. I don't just camp for the weekend. I do a "Fly-About" (the aerial version of the Australian Walkabout) and fly for 3 to 4 MONTHS at a time. Doing so, I've had the opportunity to check out gear in mild and INTENSE environments. 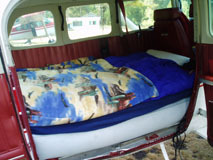 I welcome input from others regarding their camping favorites and I'll add good tips to the site. Oshkosh requires that parked aircraft use tiedowns. I've been there when a microburst hit and the severe winds and torrential downpour made the campground look like a war zone. Tents torn, flattened or blown down the runway, poles everywhere, sleeping bags soaked, everything that wasn't tied down had blown away. So tiedowns are a good idea. There are good tiedown …and lousy tiedowns. Shown left is a photo taken at Oshkosh. It's a bucket chock FULL of broken curly type tiedowns. They literally snapped off while the owners were attempting to get them into or out of the ground. Oshkosh officials said the snapped off ends were a big hazard and were virtually impossible to remove them. This is another style. Not as bad as the curly ones, but even a 97 pound weakling like me has bent a few attempting to get them into hard ground. The process is difficult to begin with as I had to use a crowbar slipped into the handle to get enough leverage to get that giant scoop to drill its way down. You don't really appreciate the value of a good tiedown until you see the result of using one that breaks or malfunctions. These photos are from a storm that hit Oshkosh which only had 35 kt winds. 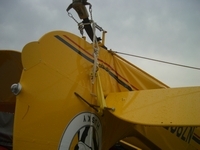 The aircraft sitting on TOP of the Bonanza was using "The Claw". You can decide for yourself, but that is a tiedown that I would NOT use for my aircraft. 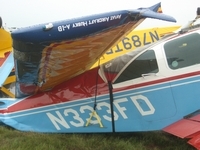 Both planes were totaled. Shown above and below: All three of the claw tiedowns broke or ripped from the ground allowing one plane to flip and land on top of the other. What was left of the claw's was still attached to the wings or tail and the severed metal is shown on the ground. Shown BELOW are the cream of the crop of tie-downs. 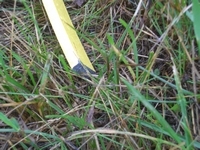 The T-shaped device on the left is what you use to remove the thin stakes. It's been updated as shown above and is extremely effortless to use. If I sound biased, it's because I am. I've used Fly-Ties for many years and they've never failed me. And they've updated them in the last two years to make a great design even better. Getting them in and out is a breeze and they have tremendous holding power. Best of all, they come in a very small pouch and are extremely lightweight. Compare THAT to those big clunky harpoons shown above. Of course, at Burningman, you'll need to bring a tie-down greeter (shown below) …but that's another story. 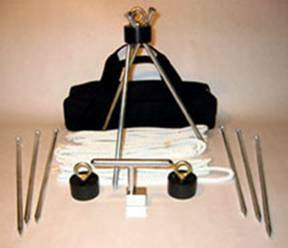 The Fly-Ties kit includes tiedown rope which will work fine. But I prefer the style shown at right. It comes with its own tie-down hooks; however, I would add one that does not have an open end. If the wing rocks too much, the open end of the hook could slip off. They're fast and easy to use and have never failed me…which is more than I can say for my knot making skills. You simply pull on the rope to cinch them down. When they get dirty, you can throw them in the wash. This little step stool folds and is perfect for fueling or cleaning the windshield. Regarding other camping equipment, my FAVORITE place to shop is REI. It's the ultimate camper's toy store. REI truly stands behind their products. I used their 6-man tent and a bottom seam began to rip (due to HEAVY use). I asked where I could have it repaired. Instead, they replaced it saying that it was a workmanship defect and was guaranteed. Mind you, this tent had just come back from Burningman where it had withstood 50 MPH winds and it was a REAL mess. They didn't care...they stand behind their products and I admire that. I always check ALL of my gear for functionality before each trip. Since I LIVE in this tent for the entire summer, it needs to be roomy and comfortable. Inside the 6-person REI tent I have a twin-sized Areobed, large folding table, 3-drawer cabinet, chair and stove. Headroom is 6'4"; it has tremendous visibility, and a secure and effective rainfly. Left: I also use Seam Sealer to back up the manufacturer's waterproofing. I seal a new tent and reseal it EVERY year. My tent has been sitting in three inches of rain water after a downpour and not leaked at all. THAT is very important when you are at higher elevations, it's cold, and you're stuck there until the weather passes... which may take days. REI Seam Lock to prevent leaks. 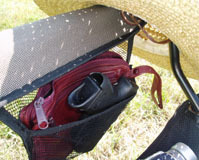 I spray Permethrim onto the outside of the tent to repel repulsive ticks. 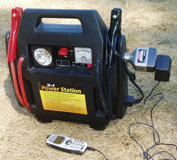 Air Compressor, Jumper and Battery Charger in one unit. 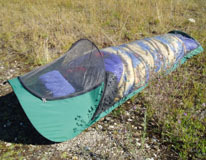 Mosquito Tent - Perfect for warm starry nights. Twin-sized Aerobed fits perfectly in the 206. Tents: Beside the large spacious tent, I bring a small mosquito tent which I use when I am only spending one night and don't want to unload plane. I use remote controlled solar lanterns to eliminate the weight of batteries. And sometimes I sleep in the plane. The main benefit of this particular heater is that it's specially designed to be safely used inside a tent or any enclosed area without worrying about the potentially lethal gasses associated with most camping heaters. It takes the standard sized propane tank, is relatively small and does a very good job of keeping you warm. I've been camping when a freak snow storm has hit and it was truly a life saver. If you're going to be near water, bring a kayak or floatie. I fly-fish and release everything right up until I get hungry. 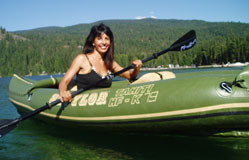 Shown above is a two-person Sevlor inflatable kayak which is best for ONE person and OK for two as long as one of them is very small. They puncture if you drag them on the ground, but repair easily. They're also VERY sensitive to wind, don't steer terribly well and will be blown all over a lake if afternoon gusts come up. 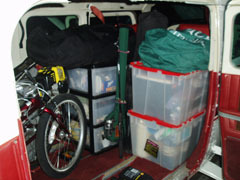 I use a rolling cart to transport the kayak, paddles, fishing gear and inflator. That's much easier than trying to carry everything. Nothing beats the taste of freshly caught trout...a little lemon and butter...YUM! I usually vacuum seal small portions of food for long trips. That eliminates the bulk of packaging and MOST important, it reduces the potential of odors that will attract bears and other hungry creatures. 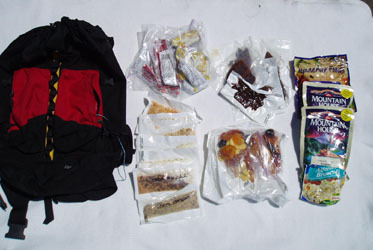 I then place the food in one backpack that I can easily hang in a tree far away from the plane. The last thing I need is a bear ripping off my aircraft door. Besides, there is nothing stinkier than bear slobber all over your stuff. With bear, mountain lion, moose and other threats, protection is smart. 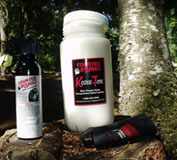 Counter Assault is the best Bear spray, but you NEED to buy the special container for transport in your airplane. It has foam to absorb it in the case of an accidental discharge which would likely immobilize. A ranger told me that bears don't like the smell of Moth Balls. He said they placed fresh fish inside of a tent and none of the bears would come bear it. I spread them around my tent and plane as a deterrent. For weapons, my personal favorite is the Gloc 27. Some planes can't handle a bike and in many cases you don't need one. But if you do, this one is the cat's meow. It's virtually a two-stroke motorcycle. Runs on regular gas OR AVGAS! Cruises at 35MPH. Prior to buying it, I did quite a bit of research. The electric one's only work if you have access to electricity. The batteries can be very heavy and in some cases you need to let the battery cool down for an hour or two before plugging in and THEN wait up to 8 hours for a full charge. 1. Noise – I wanted a motor with low decibels. Factory specs say at 20 mph it's only 68 dB and 85 dB at 30 MPH. ) That's quiet! 2. Power – Electric was out of the question for me and I wanted speed. With my weight (a big factor) it cruises along at up to 40 mph. Higher weight will likely decrease the speed, but it may still be faster than anything else you can find. With pedal assist, I've been able to climb some very steep hills! 3. Fuel- Optimally I needed the motor to run on BOTH car and avgas. That way even in the bush, I would plenty of fuel supply. My bike goes over 200 MPG on the flat. The Standard one-liter fuel tank delivers over 40 miles non-stop at 25+ MPH. It has a 50 to one gas/oil ratio. 4. 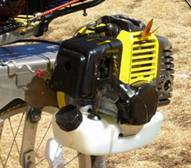 Forestry Approved– The motor needed to be forestry approved. Mine has a spark arrestor and is approved. 5. Weight: It needed to be less than 40 pounds so that I could easily lift it in and out of the plane. (At 97 pounds, that's almost half my body weight, so YOU may have higher requirements for strength, but aircraft loading is another issue. 6. Speed: I wanted it to go fast. This bike will go faster than I want to ride it. With my weight (a big factor) it cruises along at 35 mph. Higher weight will likely decrease the speed, but it may still be faster than anything else you can find. 7. Size: It needed to fold into the smallest compact size. 8. Durability: It needed to be able to handle very rough forestry roads without bending and have BEEFY tires available because I didn't want a flat after exploring 10 miles into the woods. 9. Utility: It needed to accommodate a big basket since I use it for hauling groceries, computers, towels, chairs…and everything else. 10. Weatherproof: It had to work in all weather AND mud. 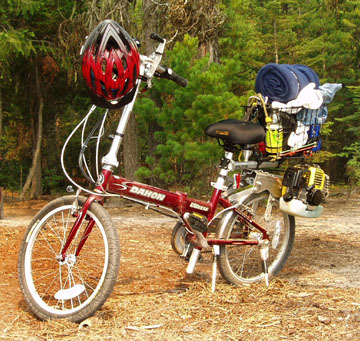 With that laundry list, this bike won hands down. 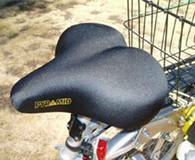 You can customize it to fit your needs…seat, tires, etc. 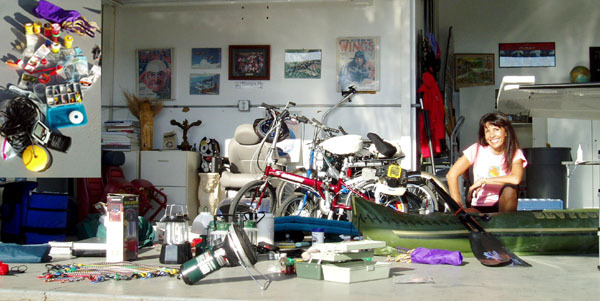 I bought mine from Dimension Edge at www.bikemotor.com. You'll find lots of information on their website and they are good guys. Tell them you saw it on Skychick's website. Call me wimpy, but I like a nice soft cushy seat. 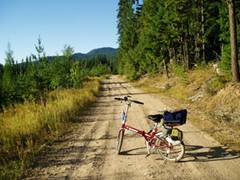 When riding 5 miles on gravel, you'll see what I mean. I use the basket to carry everything... see photo above. I have the Mistubishi motor. It's quite and easy to start. NOTE: DO NOT FLY WITH IT FULL OF GAS! The gas expands as you climb and it will REALLY stink up your cabin and make you nauseous. I use Hookworm tires. They are heavy duty and virtually impervious to punctures. I also fill them with that green stuff that seals a puncture. 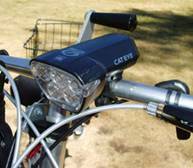 Just in case you get stuck out at night, I use a CatEye light. It's very bright and works great. 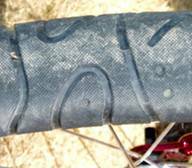 As shown, the tread is made to grip. I use the stone roller instead of the wood since it grips better on wet roads. This bike can handle very rough roads and has no problem on fire trails. The chain guard protects it from objects that can dislodge or harm the chain or gears. Cell Phones: Regarding regular cell phones, my experience is that Verizon Wireless is the best across the country. When selecting a "camping" phone, I sacrifice color screens with fancy bells and whistles for the longest battery life I can find. I bring at least two batteries and use a small solar panel to recharge them. GSM phones are for big cities only...they just don't have the coverage yet. Satellite Phones: Most of my favorite places are remote and have no cellular coverage. I've been able to run a company from the "bush" using the right combination of technology. (See Mobile Office for more info). If you are remote enough to need a satellite phone, be aware that you may STILL need to walk around, phone in hand, searching for the strongest signal. Since remote airstrips are often in deep canyons, you may need to wait for a satellite to pass overhead before you will get a signal or in some cases seek higher ground. Rates can range from $.25 to $1.50 per minute depending on your service plan. There is normally a set-up fee and a monthly fee which may includes some minutes. I bought a GlobalStar phone because it was inexpensive and worked in all of countries where I planned to use it. The newest Iridium phones are smaller, more expensive, work worldwide and may have slightly better reception. Nothing beats a nice set of bungy cords. I have every size and they always come in handy for something.